On my visit to Kefalonia 2 years ago I spent a half day in the capital Argostoli. 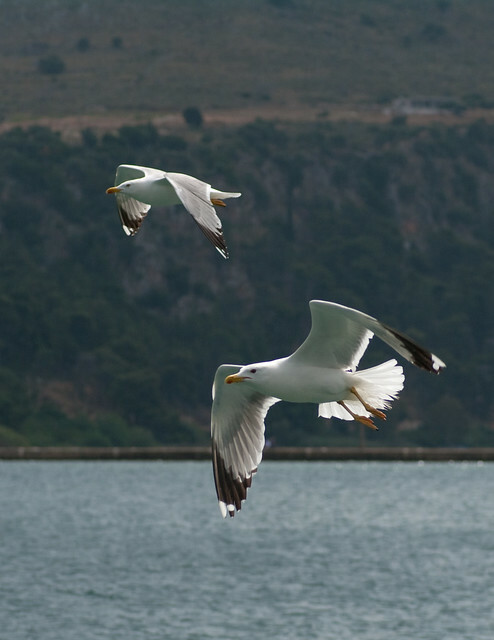 In the harbour there were a number of yellow legged gulls. 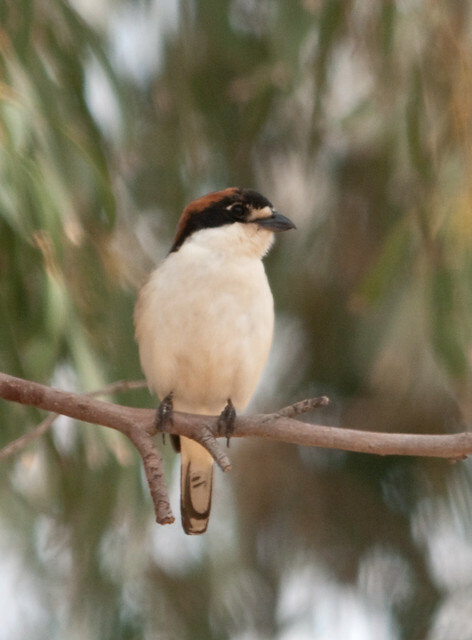 Walking along the shore path I came across the first shrike I had ever seen, a woodchat shrike. The harbour is famous for the tame loggerhead turtle. I got ok views of one but the best photo I could managed was this! My wife and I have also spent a little time in Kefalonia over the last few years – twice in the last five years in fact – both times in August. 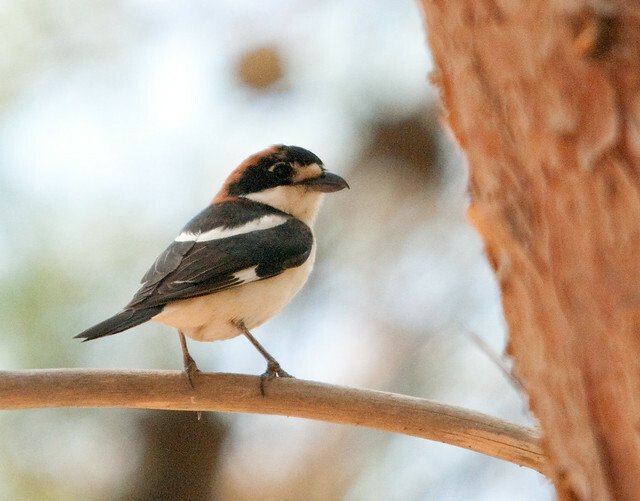 Your woodchat shrike reminded me of the shrike that visited us regularly on the west side of the island (we were in a tiny villa perched on a hill between Lassi and Argostoli with fantastic views and I thoroughly recommend it). We had a little owl perch on our balcony each night also – occasionally whilst I was sitting in the dark on the balcony behind it! I hope you managed to get up Mount Ainos (where we saw Alpine Swifts) and should you ever go again, I’d really suggest spending much more time in Argostoli. Not only are there the best seafood restaurants on the island in the city (where many of the locals go for their eat out fish – but the staff dont speak much English!) but the surrounding area is teeming with wildlife. 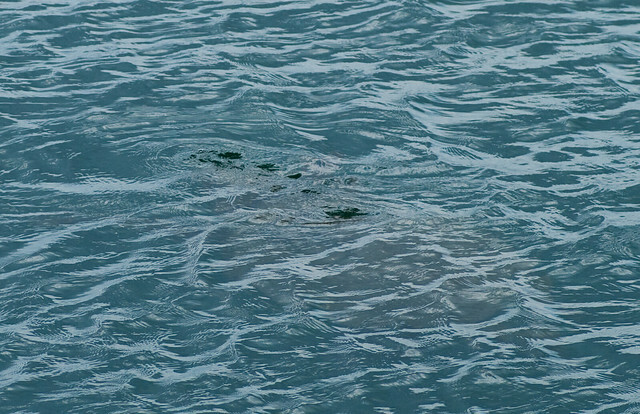 My favourite of my loggerhead turtles photographs I got during our sojourn in Kefalonia was this one I guess…. I hope you managed to see Mytros beach also (on the north of the island) – its where I proposed to my wife quite a few years ago. A lovely island and your post reminded me of all the good times my wife and I had there, so thanks for that. I am currently in my hotel in Skala after my 1st week of 2 two here in Kefalonia (I came back for more, this time with a car to explore more!). We went back to Argostoli a few days and found the fishing boats just after 10am and were treated to great views, and hopefully the shots I got with my wide angle and polariser will look as good as I hope on my PC when I get home! Been up mount Anos to, not much wildlife (except for the firecrests) but amazing views and they have now tarmaced all the way to the summit which was handy. Was your little owl definitely a little as there are scops owls around too? Ive heard scops owls again this year around Skala and nightjars but not seen either this time. I ve not got many good photos of birds here but the butterflies and dragonflies have been great and I have a few nice shots of the balkan wall lizards too. Ha! My wife and I destroyed (literally) our hire car taking it up Mt.Ainos before it was tarmacadamed!!! (And I’d forgotten about the firecrests so thanks for reminding me). It was definitely a little owl – I should know, I sat 6 feet from it! This is a scops owl (in Turkey last year)…. I figured you’d know a little owl but thought I’d check. Had to cancel argostoli today as the weather is a bit rubbish.I’m in poros having just visited lake avitos. Was great a few days ago but the dull weather meant less dragons and butterflies.